What is Prana and Where Did Pranayama Come From? It was discovered thousands of years ago that the quantity and quality of prana and the way it flows through the nadis (subtle energy channels) determines one’s state of mind if you notice when we are stressed we hold our breath and bread from the top of our chest instead of our lower lungs. Breath is essential to life. It is the first thing we do when we are born and the last thing we do when we leave. In between that time, we take about half a billion breaths more or less everyone is different. What we may not realize is that the mind, body, and breath are intimately connected and can influence each other in a very deep way. Our breathing is influenced by our thoughts, and our thoughts and physiology can be influenced by our breath. Learning to breathe consciously and with awareness can be a valuable tool in helping to restore balance in the mind and body. Breath is essential to life. It is the first thing we do when we are born and the last thing we do when we leave. In between that time, we take about half a billion breaths more-less every one is different. What we may not realize is that the mind, body, and breath are intimately connected and can profoundly influence each other. Our breathing is shaped by our thoughts, and our views and physiology can be altered by our breath. Learning to breathe consciously and with awareness can be a valuable tool in helping to restore balance in the mind and body. In the medical community, there is a growing appreciation for the positive impact that deep breathing can have on the physiology, both in mind and the body. According to the research, many of these beneficial effects can be attributed to reducing the stress response in the body, by that reducing inflammation mentally and physically. To understand how this works, let’s look at the stress response in more detail. When you experience stressful thoughts, your sympathetic nervous system triggers the body’s ancient fight-or-flight response, giving you a burst of energy to respond to the perceived danger. Your breathing becomes shallow and rapid, and you primarily breathe from the chest and not the lower lungs this action accelerates the heartbeat influencing blood pressure, relating adrenaline now the Adrenal glands get compromised and so on. This can make you feel short of breath, which is a common symptom when you feel anxious or frustrated. At the same time, your body produces a surge of hormones such as cortisol and epinephrine (also known as adrenaline), which increase your blood pressure and pulse rate and put you in a revved-up state of high alert the whole system is in alarm mode. The Vagus nerve is a huge deal, and what activating this nerve does to the entire body system. We can enable this nerve with our breath, check the image below so you can get an idea of how tremendous effect this nerve has on our wellbeing. Also, with deep breathing, you engage the abdominal muscles. 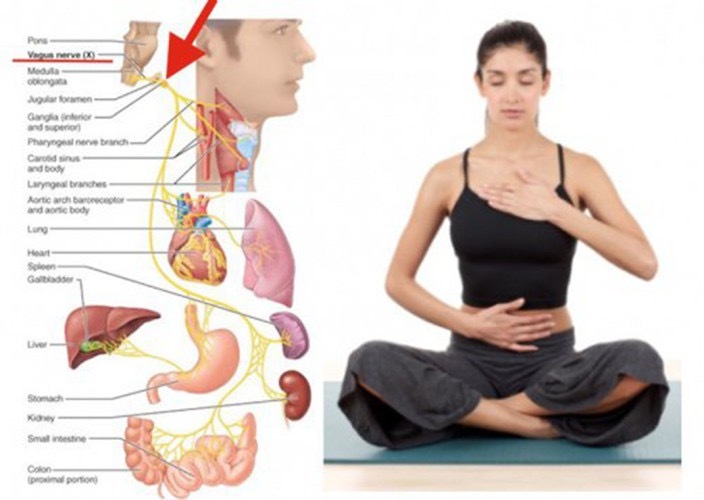 The diaphragm works here instead of the muscles in the upper chest and neck ( when we spend long periods of time in stress mode or computer work etc. and we hold the breath in the upper region of our body we can definitely attribute a stiff neck resulting from this action). This conditioning of the respiratory muscles results in improved efficiency of oxygen exchange with every breath by allowing more air exchange to occur in the lower lungs. It also reduces strain on the muscles of the neck and upper chest, allowing these muscles to relax. In short, deep breathing is more relaxing and efficient, allowing higher volumes of oxygen to reach the body’s cells and tissues. As well as reversing the physical stress response in the body, deep breathing can help calm and slow down the emotional turbulence in the mind. Breath can have an immediate effect on diffusing emotional energy, so there is less reactivity to our emotions. Beyond the practice of pure deep breathing, the ancient yogis described different types of rhythmic deep breathing techniques that can have differing effects on the mind and body. In fact, many studies document the beneficial effects of yogic breathing in treating depression, anxiety, PTSD (posttraumatic stress disorder), COPD (chronic destructive pulmonary disease), and asthma, aside from all the physiological benefits. There are also theories that support the notion that by slowing down and controlling the breath, we can improve our longevity. The basis for all profound breathing practices originates in the science of yoga, specifically the branch of yoga known as pranayama. The word pranayama is derived from two Sanskrit words: prana (life force) and yama (control). By controlling the breath, you can influence every aspect of your life. You can train yourself to breathe in a way that has a positive influence on your health. Learning the basics of diaphragmatic breathing can improve your practice and leave you with a sense of calm and ease. At some point along your path, you’re likely to hear breathing instructions like these: Now lie on your back, and we’ll do diaphragmatic breathing. Breathe into your belly, letting it rise on the inhalation and fall on the exhalation. Don’t let your rib cage lift. If your rib cage moves up and down but your abdomen does not, you’re not using your diaphragm. Belly breathing is the deepest breathing. Those instructions are riddled with myths misconceptions and half-truths. But even though they are anatomically inaccurate, they are not wrong. The practice they describe, known as diaphragmatic belly breathing, is perfectly legitimate. It’s true that emphasizing abdominal movement while keeping the rib cage relatively immobile engages your diaphragm and creates a breath that feels wonderfully calming. But it’s not true that allowing your ribs to lift or keeping your abdomen still always creates shallow, nondiaphragmatic breathing. It’s understandable where this myth came from. 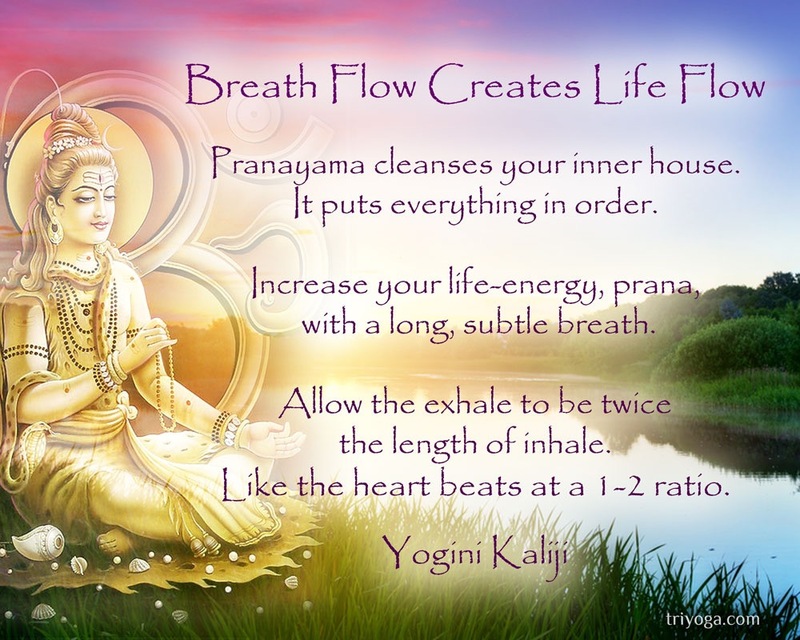 Many of us come to a Pranayama practice as “chest breathers,” meaning we’re accustomed to an unhealthy pattern of initiating the breath from the chest, which can be agitating and no aid to stress. When you fall into a pattern of isolated upper-chest breathing, you grossly overuse muscles in the neck and upper body (known as the accessory muscles of inspiration) and underuse the diaphragm. During heavy exercise and in emergency situations, you need these accessory muscles: They kick in to supplement the diaphragm’s action by moving the rib cage up and down more vigorously, helping to bring more air to the lungs. But unlike the diaphragm, which is designed to work indefinitely, the accessory muscles tire more easily, and overusing them will eventually leave you feeling fatigued and anxious not the ideal considering that most of us need to reduce stress. All of this makes upper-chest breathing exhausting, rather than restorative, in everyday situations. It’s no wonder, why the ancient yogis recommended diaphragmatic breathing. Is one type of breathing, however, that strongly activates the upper torso yet creates a full, deep pattern of breath. We’ll call it diaphragmatic rib cage breathing because it uses the diaphragm to lift and spread the ribs on inhalation and ease them back down on exhalation while keeping the belly relatively still. Belly breathing, which massages the abdominal organs more than rib cage breathing, often feels more natural and soothing and is easier to learn. It’s an excellent introduction to breath awareness for beginners and a good way to teach people to calm themselves quickly, especially during an anxiety attack, because it strongly discourages use of the accessory muscles of inspiration. Diaphragmatic rib cage breathing is a bit more challenging in the beginning, and it can stray into inefficient, anxiety-promoting upper-chest breathing if done incorrectly. But if performed properly, it is calming and much more powerful for strengthening the diaphragm, deepening the inhalation, stretching the lungs, and more effectively aerating all parts of the lungs. To understand the action behind diaphragmatic rib cage breathing, it’s helpful to know how the rib cage, abdomen, and diaphragm work together to move air into and out of your lungs. Think of your torso as a partly flattened cylinder divided into upper and lower sections. The upper section, whose walls are formed mainly by the rib cage, is called the thoracic cavity. It is almost entirely filled by the lungs, but it also contains the heart. The lower section, whose walls are formed mainly by the abdominal muscles, is called the abdominal cavity. It contains all the other organs of the trunk (liver, stomach, and so on), bathed in fluid. The divider between these two cavities is the diaphragm, a roughly dome-shaped sheet of muscle and tendon that serves as both the ceiling of the abdominal cavity and the floor of the thoracic cavity. Become aware of your normal breathing. Before you practice abdominal breathing, pay attention to your normal patterns of breathing. diaphragmatic breathing should work to alter the normal pace and size of your breaths to promote relaxation. closed-off room away from distractions. shallow? See if there’s anything about your breathing that feels abnormal. Doing occasional abdominal breathing exercises can help regulate normal breathing. • Breathe with the diaphragm, allowing the ribs to slightly flare out to the sides, while the shoulders, upper chest, and abdomen remain motionless. • Breathe smoothly, allowing no jerkiness or irregularities to disturb the steady flow. • Breathe slowly, but within your comfortable capacity, not straining or getting insufficient air. • Breathe at a comfortable depth; deeply, not shallow, but also not exaggerating the depth. • Allow the breath to flow continuously, with no pause allowed between the breaths, either between inhalation and exhalation or between exhalation and inhalation. • Breathe evenly, so that exhalation and inhalation are of the same duration. Once that is comfortable, allow the exhalation to be twice as long as the inhalation during the practice time. 1-Lie on your back and relax your body. Find a flat surface and lie down. Lie down on your back with your knees slightly bent and your feet flat against the surface. If you need extra support, put a pillow under your legs to keep your knees up. 2- Place your hands on your chest and abdomen. Once you’re lying down, it helps to position your hands in a way that will allow you to track your breathing. Place one hand on your upper chest and the other below your ribcage on the lower part of your belly. Relax your hands as much as you can, allowing your elbows to rest on the ground, bed, or sofa wherever you are laying on. 3- Inhale slowly through your nose. Once you’re in a comfortable position, you can begin the breathing exercise. You should inhale into your abdomen, so the hand on your stomach moves upward while the hand on your chest remains as still as possible. You do not need to count, but you should inhale until you cannot comfortably take in more air. Exhale slowly through your mouth or nose. As you exhale, tighten your stomach muscles. Push out as much air as you can by using your abdominal muscles as you exhale. Breathe through pursed lips as you let the breath out. Exhale until you cannot comfortably continue to breathe out. ◦ As an alternative to breathing out through pursed lips, try the Ujjayi breathing technique. Keep your lips sealed and exhale through your nose. As you exhale, tighten the muscles in the back of your throat to push the breath out. ◦ Once you’re finished exhaling, repeat the exercise. Continue the exercise for about 5 to 10 minutes. the mind along with that inhalation. in the mind along with that exhalation. Universal mantra: The Soham mantra has been called the universal mantra because of the fact that its vibration is already a part of the breath, and everybody breathes. Sooooo… is the sound of inhalation, and Hummmm… is the sound of exhalation. Breath is a bridge between the body and the mind. When trying to meditate it is extremely common to have tension in the muscles and noisy thoughts in the mind. The nervous system is the arbiter between the tense body and the noisy mind. One of the best ways to regulate that nervous system, and in turn the body and mind, is through the breath. This has been known by the Yogis for thousands of years and has also come to be widely known in recent years by the modern medical and psychological community. Note that the practice is designed for you to do silently, by remembering the mantra internally. You cannot repeat the mantra aloud with the recording, as you would have to be speaking during your inhalation, which does not work. Instead, you remember the mantra in the mind, the way you automatically remember a song you like and you are at a public place where you can say out loud. When you practice So Hum Mantra without the recording, it is still done silently and internally is for you to connect with your breath and higher self. On this Powerpoint page, the sound was intentionally recorded with the nose directly beside a microphone and was then amplified. This was done so that you can hear the subtle difference between inhalation and exhalation, and how they relate to Soham mantra. When you breathe with the Soham mantra remembered internally, your breath should be very quiet! • No pause: Allow there to be no pauses between breaths. Inhalation naturally, smoothly transitions into exhalation, and exhalation naturally transitions into inhalation. • Silent: The breath itself is quiet, with the sound of the mantra only remembered internally. • No jerkiness: Gradually eliminate any jerkiness or irregularities, so that the breath is smooth. The bumps in the breath come from the mind, and calming the breath will, in turn, calm the mind. • Slow: A comfortably slow breath is very beneficial. The rate of the mantra in the recording will bring your breath to a comfortable rate. • Diaphragmatic: Breathe with the diaphragm, the large muscle connected all the way around the inside of the lower rib cage. The muscles of the lower abdomen and the upper chest are not needed to breathe diaphragmatically. 1-Diaphragm: Place your attention in the area of the diaphragm, in a palm-sized space, just below the breastbone. Allow the inhalation to flow in unison with the sound Sooooo… of the Soham mantra. Allow the exhalation to flow in unison with the sound Hummmm… of the So Hum mantra. Observe the feel of the motion from the inside, and allow there to be no pauses between breaths. Inhalation naturally transitions into exhalation, and exhalation naturally transitions into inhalation. The breath will naturally become smooth and quiet. 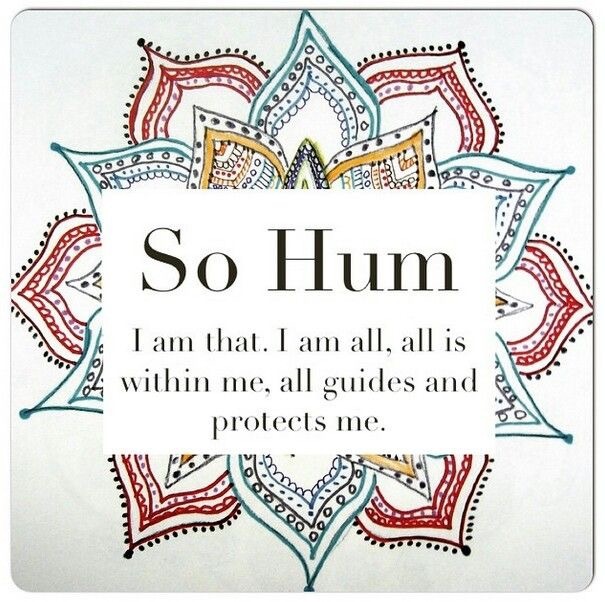 The sound of the Sohum mantra will gently regulate the speed of the breath. 2-Spine: With inhalation, allow your inner attention to move upwards with Sooooo…, from the base of the spine to the top of the head. With an exhalation, allow your inner attention to move down with Hummmm…, from the top of the head to the base of the spine. You might also look for a thin, milky white stream flowing there with the breath, though that is not necessary if you do not see such an image. Once again, you gently transition between breaths, with no pause between the breaths. 3-Chakras: Similar to the breath along the spine, allow your attention to flow with So Hum mantra between two chakras, or energy centers that may be needing special attention or balancing. For example, inhale from the navel center to the heart center, and exhale from the heart to the navel, or inhale from the heart center to the eyebrow center, and exhale from the from the eyebrow center to the heart. Whichever two chakras are used, the inhalation is upwards, and the exhalation is downwards. 4-Nostrils: Place your attention at the bridge of the nostrils, feeling the touch of the air moving in and out of your nostrils. Coordinate the inhalation with the sound Sooooo… of the So Hum mantra. Coordinate the exhalation with the sound Hummmm… of the Soham mantra. If one nostril seems to be flowing less freely, it is good to place the attention on that nostril. When both nostrils flow freely, there is a joy that comes, and the mind wants only to do meditation. It is called Sandhya, the wedding of the sun and the moon (ha and tha of hatha), of Ida and Pingala, the left and right energies of the subtle body. This allows energy to flow in the central channel Sushumna. 5-All three methods above: Sequentially do each of the three practices above with So Hum mantra, starting with breath awareness at the diaphragm, followed by the breath along the spine, and then breath awareness at the bridge of the nostrils. Divide the time approximately evenly between the three, or however feels comfortable and natural. Remember, the difference between the So Hum mantra methods is the placement of your attention, while you continue to breathe smoothly, quietly, and with no pauses between breaths. No pause: When you listen to the breath recording, it may sound like there is a pause between breaths, although there is not. During transitions between breaths, the breath slows for a moment and becomes inaudible in the recording. The transition between breaths is smooth, and you again hear the next sound of either exhalation or inhalation. However, there is no pause wherein breath is held. Eliminating the pause is an important part of healthy breathing and doing the Soham practice. Is certain types of Breathing practices that require pausing and there you do so. Nadi Shodhana, or Alternate-Nostril breath, is touted for its ability to reduce stress and still the mind. Nadi Shodhana means “clearing the channels of circulation.” This practice consists of sitting quietly and breathing into each nostril separately by plugging one nostril and breathing in the opposite nostril. The instruction is to practice going back and forth between each nostril slowly and rhythmically. The practitioner covers the left nostril, breathes in through the right; covers the right nostril, exhales through the left. Then he or she repeats this on the other side: Covers the right nostril, breathe in through the left, and onward. Some of the yogic benefits of this practice include calming the mind and reducing stress, releasing tension from the chest and abdomen, and balancing the flow of prana in the Nadis (energy channels). Preliminary studies show that Nadi Shodhana decreases blood pressure, increases skin conductance (which is a marker of sympathetic activity), and increases heart rate. Interestingly, as many yogis have noticed in their own practice, breathing through one nostril compared to the other produces different effects on the body. For example, in the same study researchers found that breathing exclusively in and out of the left nostril decreases blood pressure, whereas breathing exclusively through the right nostril increases blood pressure. This aligns with the yogic view that breathing into the left nostril activates the Ida, the energy channel associated with rest and relaxation and that breathing into the right nostril activates the Pingala, the energy channel associated with activity and action. In conclusion, Nadi Shodhana helps balance the nervous system, evening out differences in sympathetic and parasympathetic tone that means it evens out the fight-or-flight system and it also reduces blood pressure, promoting a greater sense of calm and relaxation. There is a predictable pattern of swelling and shrinkage that was first described (scientifically) by the German physician Richard Kayser in 1895. He had observed periodic cycles of congestion and decongestion that alternated between the right and left nostril, which was later termed “nasal cycle”. This phenomenon is widely known in the scientific community and has been subject to multiple studies. The funny thing is that yogis had known about it for hundreds of years and used it effectively to change the body’s temperature and one’s mental state, but we’ll get to that later. At any given moment you are breathing through one dominant nostril; then sometime later you switch to another one. This switch happens every 2-2.5 hours (although it can vary), and continues in a rhythmical fashion. Swelling and shrinking seem to be related to sympathetic (SNS) and parasympathetic (PNS) nerves. 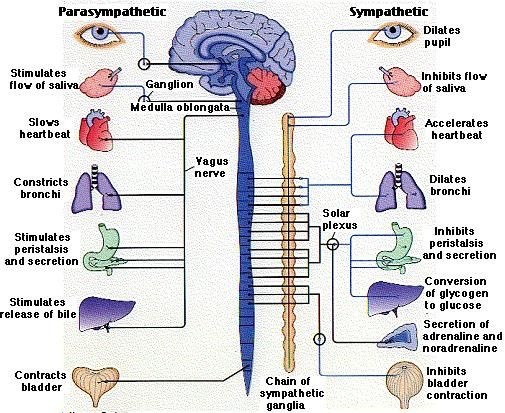 Most organs in the body (including cerebral hemispheres) are innervated by fibers from both SNS sympathetic nervous system(fight-or-flight) and PNS parasympathetic nervous system(rest-and-digest). There are a bunch of those nerves in the nose, too. We have one set of the nerves that covers the right side of the body and the right nostril, and another one that covers the left side and the left nostril. What scientists are finding now is that those fibers have opposing effects. This means that at any given moment you have sympathetic dominance on one side of the body (and breathe mostly through that nostril) and parasympathetic dominance on the other. Then sometime later they switch. This is called “lateralized ultradian rhythms of the ANS”. So basically the nasal cycle is an indicator of the switch that happens between the SNS (sympathetic nervous system) and PNS (parasympathetic nervous system)from one side to another. Multiple research studies show that the way your body functions is quite different based on which side of the body has sympathetic dominance. So basically in the course of the day, you alternate between more active and more restful states, which is confirmed by a widely accepted BRAC hypothesis (basic rest-activity cycle). Thank you for all your support of I-RAMA and please remember to like and share so that others can benefit from the information we provide. 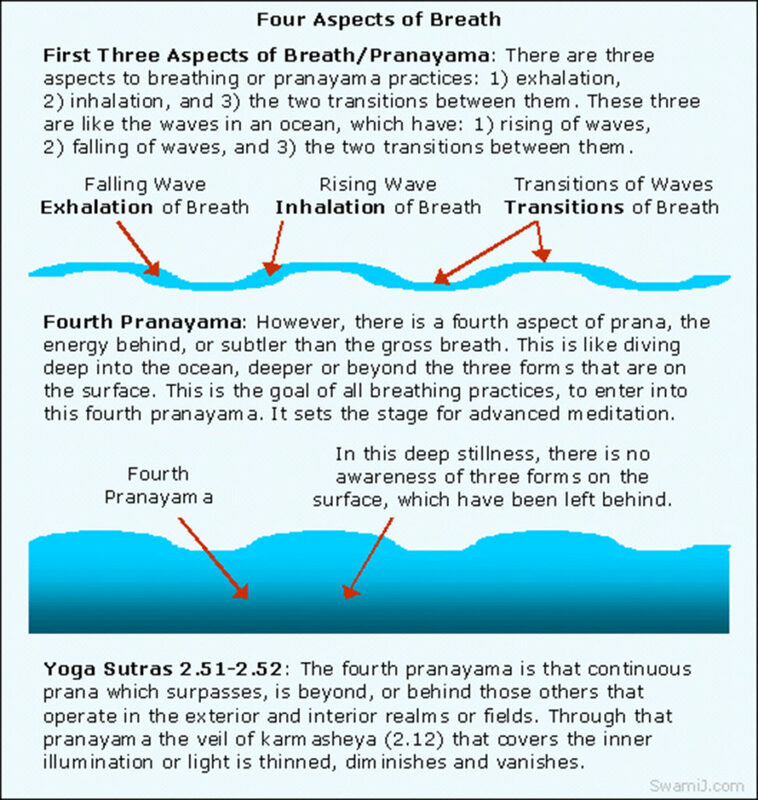 Stay tuned for part three to learn more Pranayam breathing technics that you can use in your daily life.